Journal of Advanced Civil Engineering Practice and Research (JACEPR) is a fast track international journal publishing peer-reviewed papers on the advanced technologies in civil engineering and applications. The main purpose of this journal is to combine research and practice in different areas of civil engineering and thus advancement of civil engineering sciences. 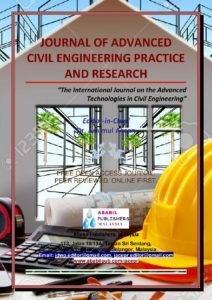 Journal of Advanced Civil Engineering Practice and Research (JACEPR) welcomes theoretical and experimental research as Full Text Papers, Short Communications, State-of-the-Art Reviews and Letters to Editors. Short Communications should be concise and novel with advanced knowledge that warrants speedy communication to the readership.